mark e… what happened to this man? mediocrity took over him, but it can be forgiven when you listen to the EARLY mark e… it was the beginning of slo-mo house, chuggy, dense, full of reverb and dropping the sample at the very end. building it slowly but surely. this one came out in 2006 on heavy vinyl in jiscomusic, what became the house of the revenge and 6th borough project in their most lucid times. it samples gabor szabo’s ‘keep smilin’ with much success and if you wait for the massive break, you will get goosebumps all over your body as long as you have a bit of musical sensibility. it was bootlegged in 2010 so you can still get some copies. This is, however, digitized in its full glory from the original release. hope you value this one as much as i do! 6th Borough Project’s debut LP, and the first full length to be released on Delusions of Grandeur is weeks away. The duo, comprising of house stalwart Craig Smith, and recent man of the moment Graeme Clark (a.k.a. The Revenge and half of OOFT) deliver an album which grows out of the blueprint of slow motion disco and mid tempo house they laid down with releases on Jiscomusic and Instruments of Rapture. Taking their inspiration from the raw and soulful end of the disco spectrum the two are adept at extracting the choicest grooves and then extending them into chugging house numbers. 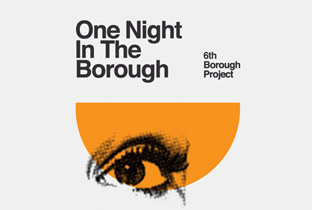 This form continues on ‘One Night In The Borough’ where their trademark sound bridges the gap between modern disco and deep house. Over the 14 tracks the duo offer variety without ever compromising the quality of the output. For the straight up house fans there’s the deep build of ‘Changin”, the warehouse jack of ‘Iznae’ or the boogie influenced ‘Back To Me’, whilst disco fans can rejoice in ‘The Fool’ with its glorious vocal breakdown (with full on crowd noise for that live vibe) and the vocal led ‘Find A Way’. There’s also plenty of the slow motion sound that the L.E.S.S. Productions stable made their own with ‘If The Feeling’s Right’ and ‘Deep C’ rocking the lowest and deepest of head nodding grooves. When an album like this comes around, it’s often the case that it never lives up to the hype. Thankfully here, the hype is fully justified, with the 6th Borough boys delivering an LP which consistently stands up to the promise of their previous singles, whilst working well as an album. To proceed the forthcoming full release, Delusions of Grandeur are releasing three 12″ EPs containing the album tracks, the first of which was released this monday. You can find links to buy all these goodies here alongside some of the essential Instruments of Rapture releases. As a bonus, here are some classic tracks from the 6th Borough and Revenge back catalogue.